In this video we will discuss the power and use of SELECT INTO statement in SQL Server. We will be using the following 2 tables for the examples. The SELECT INTO statement in SQL Server, selects data from one table and inserts it into a new table. 1. Copy all rows and columns from an existing table into a new table. This is extremely useful when you want to make a backup copy of the existing table. 2. Copy all rows and columns from an existing table into a new table in an external database. 6. 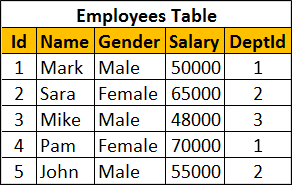 Create a new table whose columns and datatypes match with an existing table. Please note : You cannot use SELECT INTO statement to select data into an existing table. For this you will have to use INSERT INTO statement. Please include some videos on understanding execution plan and performance tuning concepts. I have a question regarding "1 <> 1" to create the table with same schema as the original table: I use "TOP 0" to get the schema of tables (e.g. : "SELECT TOP 0 * FROM MyTable"), and I tried using TOP 0 instead of "WHERE 1 <> 1" and it worked, and so my question is: what is the best way to get the schema to the original table? is it via using "TOP 0" or via using "WHERE 1 <> 1" or something else? please include some video on understanding execution plan & performance tuning concept.